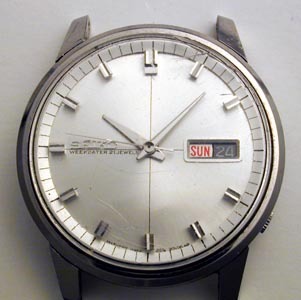 My very first watch was a simple manual wind pin-lever Timex I received when I was about 10 years old (ca. 1978). All I can remember about it is that it had a black plastic case, dial, and strap, and sporty green glow-in-the-dark numerals. This watch didn’t survive for more than a month, as I constantly wound it. It is no wonder that my parents didn’t get me another watch until quartz was available. The oldest watch I can remember seeing was my father’s self-winding Seiko day-date. I remember it being “very classy”, and had an interesting feel when being shaken because the rotor winding system had a slight “springiness” which could be felt through the case. I hadn’t seen this watch since the late 70s, until my father dug it out for me a couple of years ago. Of course, now that I look at it, I can see that my taste as a child must have been considerably different. Seiko has long borrowed design elements from other, perhaps more prestigious watches; however, I’m not sure that Mido should have been a target. All of the pieces on the dial, with exception of the second hand, are shiny plastic. The Caliber 6619A movement in this watch is a 21 jewel, self-winding movement. 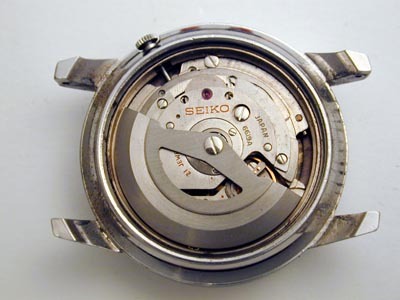 Like a lot of the Seiko automatics, there is no provision for manual winding via the crown. However, there is definitely a certain simple elegance to the movement, even if the the construction is basic. 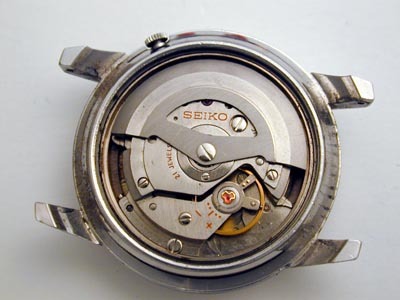 Note the “diashock” shock protection on the balance, and what appears to be the Seiko equivalent of a glucydur balance. Another interesting feature of this movement is that the date is advanced by pushing on the crown at 4 o’clock. I got this monstrosity when I was in high school. This “data bank” watch used a series of LCD pixels to display characters, rather than the more commonly seen 7-segment LCD displays. 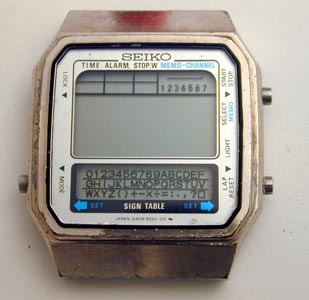 In addition to spelling out the date in English and a stopwatch/alarm, the watch also had the capability to store up to 7 screens of 16 characters – the character set being shown on the bottom window. Unfortunately, this was more of a novelty rather than the first wristwatch Personal Digital Assistant, as the only way to enter characters was to slew a blinking cursor back and forth over the characters in the bottom window using the two lower buttons on the sides of the case – it probably took about 2 minutes to enter a telephone number, much less a name associated with the number. 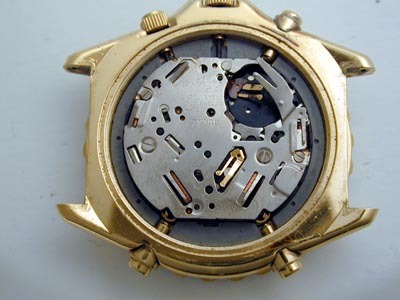 Despite the circular shape of the movement well in the case, the movement itself is actually a square with cut off corners (the copper piece around the movement served as an extra path to ground for the case.) The movement plates seem to be entirely made of plastic. To a teenager in the early 80s, this was the height of coolness. 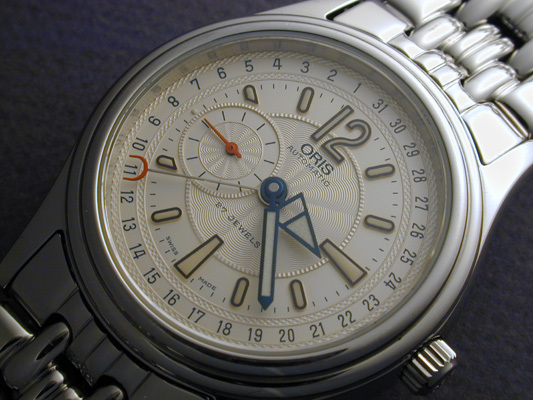 This watch was the first analog chronograph I had ever seen, although the concept was once and is now again widespread. The constant second hand was located at 6 o’clock, with a 30 minute counter at 9 and a 1/20 second counter at 3. 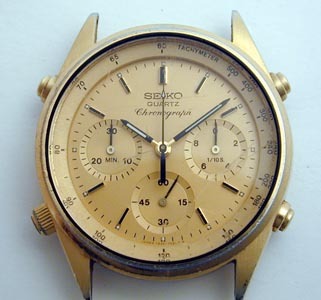 Unlike the commonly used ETA quartz chronographs that are seen today, when the stopwatch was running, the 1/20 second hand spun around continuously. I was paranoid for a long time that the hands would fall off if I gave it a shock, but it survived 6 years of daily wear without any problems at all, and the styling still looks good after almost 20 years. The movement is actually pretty nicely done, with a subtle stripe decoration on the top plate. It has 15 jewels, most notably for the 1/20th second hand, and there is also provision for fine adjustment of the running rate. 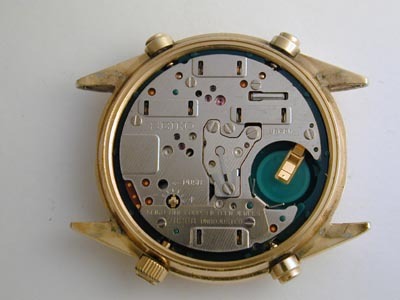 Four separate stepper motors are used in this movement, one to drive the timekeeping train, and three to drive each chronograph hand independently. The cover for the coils of these motors are visible in the scan. Finally, when I got out of graduate school, I had some flying lessons under my belt, and was going to work for an airline as an avionics engineer. I decided that I “needed” a real pilot’s watch. Aside from the unobtainable Breitlings (“who would pay $1000 for a watch?? 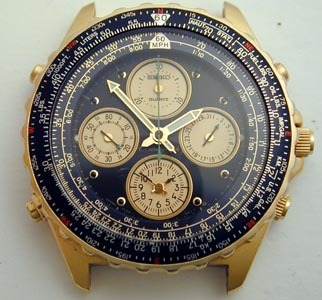 ?”), the Seiko flight computer definitely had all the “real” pilot gizmos – an E6B circular slide rule with conversion markings, a sweep chronograph second hand to 1/5 of a second, and a second timezone to keep track of “zulu” time. 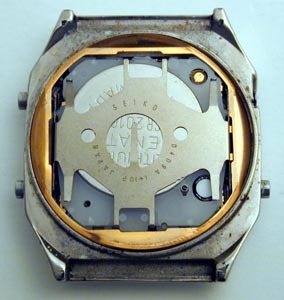 This watch demonstrates what is possible with modern microelectronics and packaging: as with the previous chronograph, there are four stepper motors: one for the timekeeping & date train (small seconds at 9 o’clock), one for the chrono second hand (central sweep), one for the chrono minute hand (12 o’clock), and one for the second timezone train (6 o’clock). What’s different is that the second timezone train is more than just a simple once-per-minute advancement of the minute hand – there is actually a memory register which keeps track of where the hands should be relative to the current time. This allows one to use the 6 o’clock train to set the alarm function in addition to keep the second timezone. After setting an alarm time via the crown at 4 o’clock, the crown can be pressed in, and the hands at 6 o’clock will spin rapidly back to the second timezone. Unfortunately, the alarm is set relative to the second timezone, and when it is armed, the second timezone cannot be read on the dial. While the circuitry of this movement is more advanced than the previous chronograph, the movement construction in some ways is a step backwards: the movement has no jewels, it is smaller and surrounded by a big plastic spacer, and the details (e.g. the coil covers) are simple flaps of metal instead of plates. This movement has barely survived the 6 years I wore it: at some point in the past I had the battery replaced, and the changer didn’t have the correct sealing gasket. I then used this watch on a project in Egypt. It couldn’t stand the sweat and dust, and pretty soon showed condensation on the inside of the crystal. Removing the back a couple of months ago, there was all sorts of gunk inside. The Dark Ages were over.